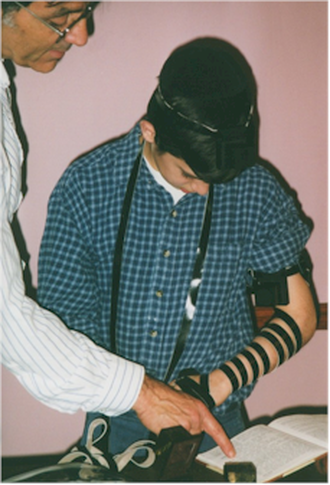 A Bar Mitzvah celebration marks the beginning of a new and special stage in a Jewish boy's life, at which time he has the great privilege of wearing tefillin for the first time. This mitzvah is of inestimable value and is one of three mitzvos of the 613 enumerated in the Torah (the other two being Shabbos and Bris) that reflect the very special relationship that we have with Hashem. Because making tefillin is so labor intensive, and because it is a one-time investment, a good quality pair of tefillin can be very expensive. This expense may be out of reach for many families. Instead of greeting this great milestone with excitement and happiness, families may find this very important occasion marked by financial fears and uncertainty. Because of these monetary concerns, the quality of tefillin that is purchased may be compromised. The Yad Yehuda Foundation was established l'ilui nishmas our dear Yehuda. The mitzvah of tefillin stood out for him and held very special meaning for him. To encourage the young Bar Mitzvah boy to apply these same special kavanos while davening with tefillin, we would like to help families unable to afford high quality tefillin. The Tefillin Assistance Program supplements the amount the family can afford and allows the young Bar Mitzvah to daven with mehudar tefillin.